Want it by Wednesday 24th April? Order within 2 days, 3 hours, 59 minutes and choose FREE UK Next Working Day Delivery (Mon-Fri) at checkout. Why an airtight loft hatch? 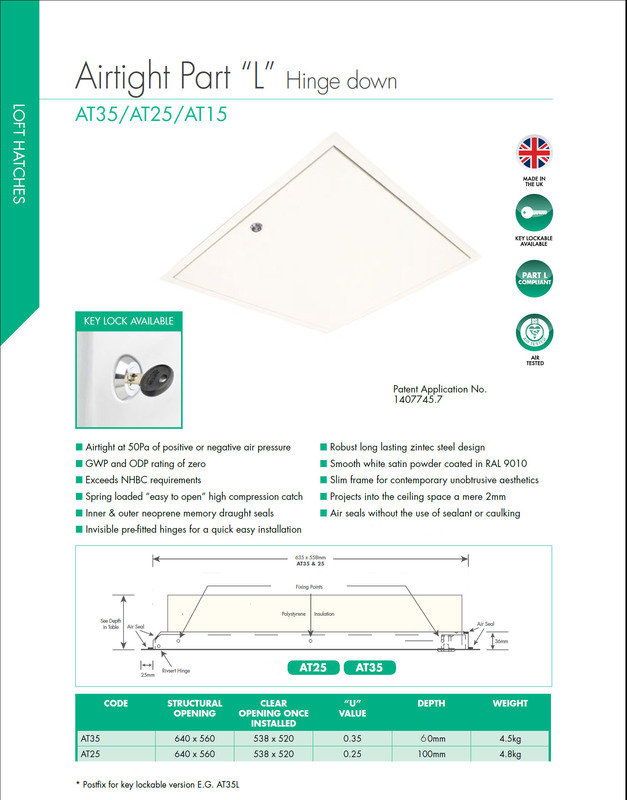 The AT35 loft hatch is the first air tight loft hatch of its kind. Insulated to meet Part L of the building regulations the AT35 is airtight in both positive and negative air pressures at 50Pa. This hatch is designed specifically to meet the stringent demands new properties are subjected to ensure they are as airtight and well insulated as possible. The air permeability test is based on BS EN 1026:2000 and BS EN 12207:2000 for a ceiling use only. Fitting is a doddle, just screw fix through the pre-drilled holes in the frame into the surrounding joists. The spring loaded twist catch lock ensures a high compression seal between the door and the frame. The outer frame is also fitted with a seal to ensure air cannot easily escape from around the outer edge of the hatch. This steel loft trap protrudes just 2mm from the ceiling when fitted. You'll also notice its lovely clean lines and smooth finish (Powder-coated in white) it's the neatest loft hatch on the market. Let's face it does anybody really want a great unsightly lump of plastic protruding from their ceiling? Showing 2 of our total 26 reviews, with an average rating of 5 stars. Read all 26 reviews for AT Airtight Loft Hch Range 640 x 560mm Hinged. The loft hatch we purchased was perfect. No more cold hallways. Would strongly recommend this product and this company. Ordered to replace a very old loft hatch, I removed the old hatch and amended the opening to fit this product. Good value loft hatch that's well insulated and does the job well!